I wrote a couple previous posts on some interesting work using deep learning to accelerate topology optimization, and a couple neural network methods for accelerating computational fluid dynamics (with source). This post is about a use of machine learning in computational fluid dynamics (CFD) with a slightly different goal: to improve the quality of solutions. Rather than a focus on getting to solutions more quickly, this post covers work focused on getting better solutions. A better solution is one that has more predictive capability. There is usually a trade-off between predictive capability, and how long it takes to get a solution. The most well-known area for improvement in predictive capability of state-of-the-practice, industrial CFD is in our turbulence and transition modeling. There are a proliferation of approaches to tackling that problem, but the overall strategy that seems to be paying off is for CFD'ers to follow the enormous investment being made by the large tech companies in techniques, open source libraries, and services for machine learning. How can those free / low-cost tools and techniques be applied to our problems? They also tried different types of training and hold-out approaches for their small database of supersonic boundary layers. The data set for training is small since direct numerical simulation (DNS) is so compute intensive. We propose a modeling paradigm, termed field inversion and machine learning (FIML), that seeks to comprehensively harness data from sources such as high-fidelity simulations and experiments to aid the creation of improved closure models for computational physics applications. In contrast to inferring model parameters, this work uses inverse modeling to obtain corrective, spatially distributed functional terms, offering a route to directly address model-form errors. Once the inference has been performed over a number of problems that are representative of the deficient physics in the closure model, machine learning techniques are used to reconstruct the model corrections in terms of variables that appear in the closure model. These reconstructed functional forms are then used to augment the closure model in a predictive computational setting. As a first demonstrative example, a scalar ordinary differential equation is considered, wherein the model equation has missing and deficient terms. Following this, the methodology is extended to the prediction of turbulent channel flow. In both of these applications, the approach is demonstrated to be able to successfully reconstruct functional corrections and yield accurate predictive solutions while providing a measure of model form uncertainties. Where does the training data come from? What are the quantities to learn (responses, targets, dependent variables)? Are they universal, at least to some extent? What are the features (predictors, independent variables)? The author presents answers addressing these questions for a RANS example. Another set of slides based on a Phase I NASA LEARN Project illustrates an approach to learning turbulence models. 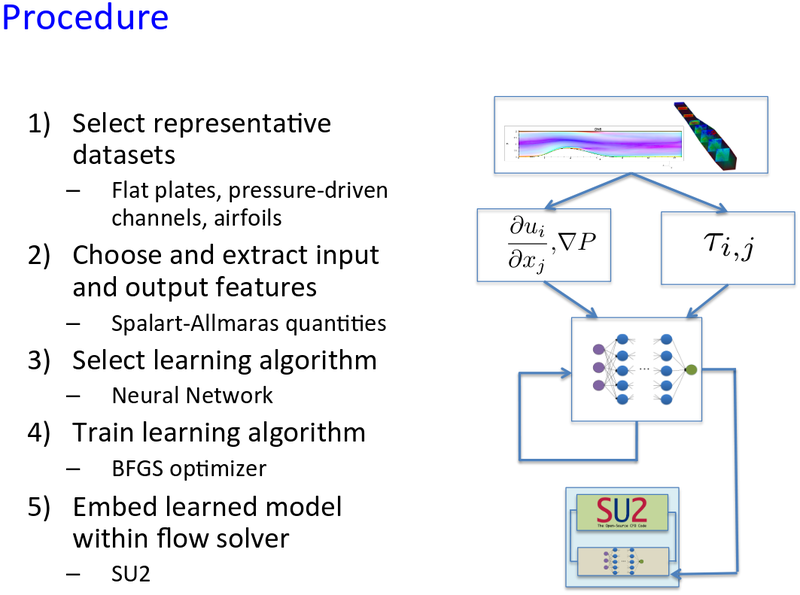 They give a proof of concept using a supervised learning approach where the features are the terms in a Spalart-­‐Allmaras turbulence model. The slides cover some tweaks the authors made to the loss function to make it more applicable to CFD. The slides also summarize a paper on transition modeling where they fit an indeterminacy field with a couple machine learning techniques: Gausian processes and neural networks. Here's a paper that applies this data-driven, or data augmented, approach to a two-equation RANS model. 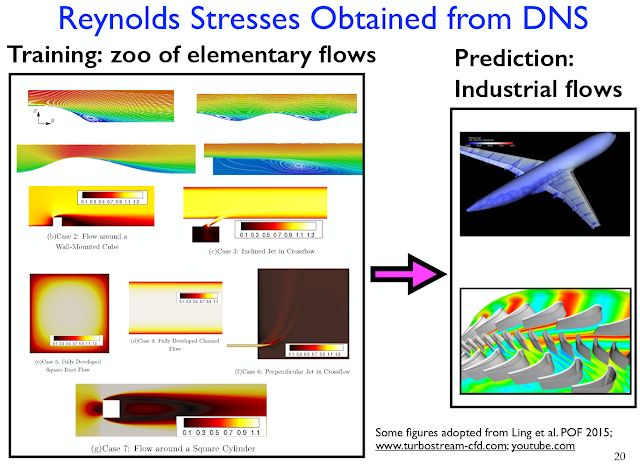 This data-driven machine learning approach to improving CFD has plenty of good ideas left to pursue. You could learn parameters of existing models, learn entirely new models, learn how to blend different models, build specific data sets to learn solutions in peculiar application areas, and probably a ton more I haven't even thought of yet. All of these results and different approaches to improving our CFD predictions are exciting, but there's always a catch. So you want to use machine learning to solve your problem? Now you have another problem: how are you going to get enough data? I like the vision for the future at the end of those LEARN Project slides: "A continuously augmented curated database/website of high-­‐fidelity CFD solutions (and experimental data!) that are input to the machine learning process." Something like that would benefit the good ideas we have now, and the ones we haven't got to yet. This is a pretty neat area of research. Please drop a comment with links to more! This article reviews applications of deep neural networks to computational fluid dynamics (specifically Reynolds Averaged Turbulence Modeling Using Deep Neural Networks with Embedded Invariance), and argues for "challenge data sets" (something akin to ImageNet) for turbulence modeling.